The Defense Department has a different kind of enemy in this countermarketing video campaign, but the message is simple: smoking is never the answer. The DoD Health Affairs recently announced this new “Fight the Enemy” campaign in hopes to inform service members about the risks that stem from tobacco use. But the campaign is also a competition — personnel, families and DoD civilians may enter their best educational video for “Fight the Enemy” until Oct. 15, and winners will be announced in mid-November. Based on DoD survey data, 17 percent of airmen smoke cigarettes, a figure slightly less than the national average. Nine percent use smokeless tobacco, a number well above the 2 percent national average, according to the release. Furthermore, DoD officials estimate that tobacco use costs $1.6 billion annually in medical costs and decreases work productivity — although tobacco use causes cancer, heart disease, stroke, lung diseases, and even impotence, it can also cause other problems that directly impact warfighters, such as reduced endurance, decreased night vision, hearing loss, decreased wound healing, and increased post-operative complications. 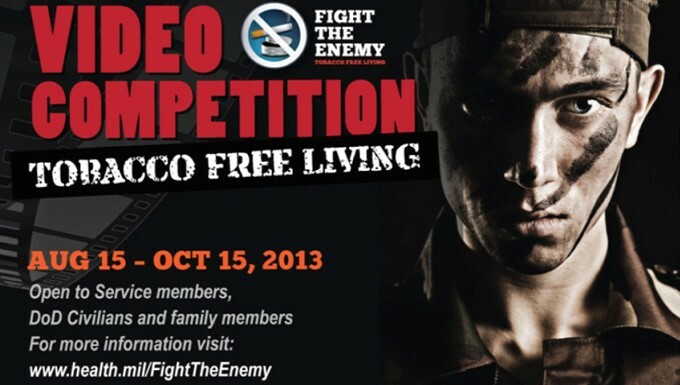 If you want to change the conversation about tobacco use, visit www.health.mil/FightTheEnemy, which also lists contest rules and additional information about entering your video in the campaign. Winners will be announced in conjunction with the American Cancer Society’s Great American Smokeout. The first prize winner’s video will be featured on the Fight the Enemy website. Winners will receive official recognition and thanks from DoD senior leaders, and all entrants will receive a gift of appreciation. For more information on how tobacco use affects you and those in your environment, as well as ways to quit, visit www.ucanquit2.org/.